Sustainable Energy author Ireland (SEAI): OLEDs The Roll-Up Lights! Looks like they have a few dead pixels on that sample! 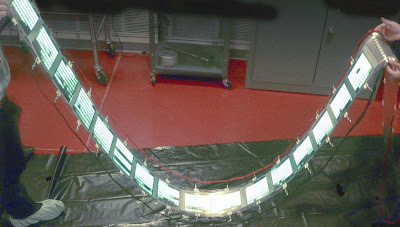 On the 11th of March 2008 General Electric announced a demonstration of the world’s first flexible roll-to-roll manufactured organic light-emitting diode (OLED). This is the first step in an industrial process which will in time dramatically reduce production costs of these lights. OLEDs are made of an organically based material sandwiched between two electrodes. They light-up when you connect them to a battery or power unit. OLEDS possibly trail-blaze the next evolution in lighting products. These flexible bits of plastic can be made in just about any shape size or colour, and will provide an entirely different way for people to light their homes or businesses. OLEDs offer the potential of dramatically improved efficiency and will be more environmentaly friendly than CFL bulbs for instance. OLEDs will be able to give high quality light of a colour and intensity similar to traditional products. Lots of researchers are currently working on the idea of “printing” electronics in much the same way as a newspaper is printed on rolls of material in a continous process. Some work of this type has been achieved on PV Solar Cells (see earlier posts on this blog). GE have now shown the way for very low cost and high efficiency LED lighting. It has taken $13 million worth of research and four years to get this far. The research could lead to other types of thin film manufacturing including possibly roll up flexible TV screens. The equipment needed to make these devices on a commercial scale does not currently exist. Back in 2004 GE demonstrated OLED devices that were fully functional. The 24-inch by 24-inch panels produced 1,200 lumens. That’s a respectable amount of light and is what a 100 watt standard filament bulb gives you. GE projects the introduction of OLED lighting products to market by the year 2010.